A film by Jean-Marie Straub & Danièle Huillet. In German with optional English subtitles. 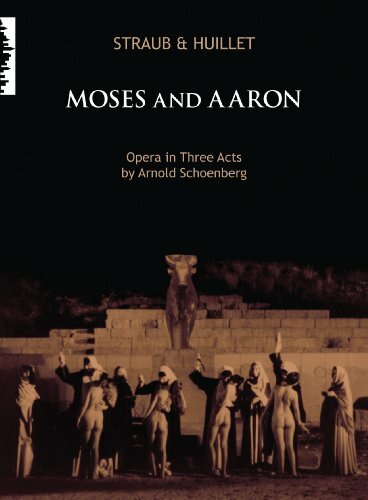 From Wikipedia: Moses und Aron has its roots in Schoenberg's earlier agitprop play, Der biblische Weg (The Biblical Way, 1926�27), which represents a response in dramatic form to the growing anti-Jewish movements in the German-speaking world after 1848 and a deeply personal expression of his own "Jewish identity" crisis. The latter began with a face-to-face encounter with anti-Semitic agitation at Mattsee, near Salzburg, during the summer of 1921, when he was forced to leave the resort because he was a Jew, although he actually converted to Protestantism in 1898. It was a traumatic experience to which Schoenberg would frequently refer, and of which a first mention appears in a letter addressed to Kandinsky (April 1923): "I have at last learnt the lesson that has been forced upon me this year, and I shall never forget it. It is that I am not a German, not a European, indeed perhaps scarcely even a human being (at least, the Europeans prefer the worst of their race to me), but that I am a Jew." Schoenberg's statement echoed that of Mahler, a convert to Catholicism, some years earlier: "I am thrice homeless: as a Bohemian among Austrians, as an Austrian among the Germans, and as a Jew throughout the entire world. I am an intruder everywhere, welcome nowhere.